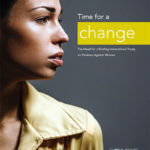 Global Rights for Women is excited to announce the publication of Time for a Change: The Need for a Binding International Treaty on Violence Against Women. We are proud to contribute to the important conversation taking place around the world about how international law can be strengthened to protect women and girls from violence. Sponsored by The Center on Women, Gender and Public Policy at the Humphrey School of Public Affairs, the University of MInnesota Law School Human Rights Center, and Global Rights for Women.